instead of tearing down all our statues -- we oughta put these eclipse glasses on all of em. that'd be pretty cool. I walked out of wallyworld 60 bucks lighter with 2 cases of good beer. And, I don't drink. So, the damn glasses are all sold out around here. The only way to get a pair is to buy a 12 pack of Schlafly Helle Eclipse beer. Each 12 pack has a pair. I walked out of wallyworld 60 bucks lighter with 2 cases of good beer. And, I don't drink. I am sure you will find someone somewhere willing to help you out with those 2 cases. I probably live closer to you than anyone else on this site, but I don't drink either. part of the AT in georgia is in the path of totality; including mountain crossings and top of georgia hostel. mountain crosssings is going to be SLAMMED with people -- and they'll probably sell each one of em one of the stickers below. they are advertising a viewing party. forest service roads in georgia are expected to be PACKED with more cars than parking spaces. I actually like that sticker, at least it didn't use the Appalachian Trail name for a quick buck. But I'm pretty sure the weeding band will have the diamond appear on the left side. 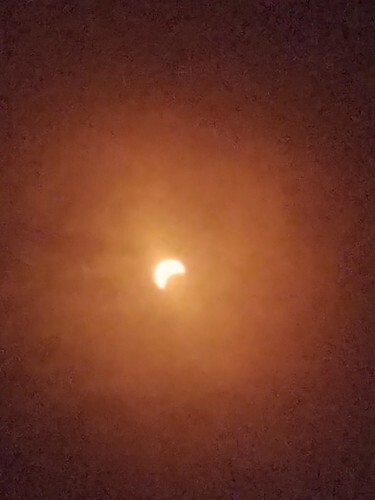 I saw the almost full eclipse in the 70s in MD. Here we will have an 85% and there may be some clouds, so I'm not expecting much. I do have the glasses, however. If I remember, I will walk outside and NOT stare at the sun. I really wanted to get a filter for my camera so I could take pictures but buying one was way out of my budget and all the rentals were scooped up months ago, so alas, I will just enjoy not working that day and might remember to walk outside. I hope people aren't waiting until Monday to look at the sky, it's been amazing this week. The forth coming eclipse event is creating Issues around here and in Idaho. Fuel prices have risen due to projected demand. Folks reserved motel and camping spots years ago are arriving to find their reservations cancelled or 'lost' and having to pay the current rate. Projected traffic flow along I-15 and other corridors is bumper to bumper for at least 24-36 hours after the event. Warnings from optometrists and other medical folks are advising not all eclipse glasses are safe for viewing. 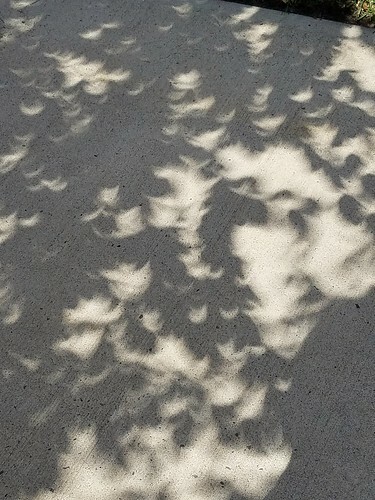 However months ago, an enterprising Scout troop bought 5k eclipse glasses at 1 dollar each and sold the last 3k pair at 7dollars each in one day. If I travel 534 miles I could be totally nuts. How many miles must you travel to be totally nuts? I plan to cut my grass during tomorrow's eclipse...so I can use my headlights during the day. After I cut the grass I'm gonna go to my local doc-in-the-box with face in hand and ketchup on them and scream "my eyes my eyes"
62 miles if i was home; but 735 miles from tucson. good thing i have no interest in viewing. Don't know, but it would be nuts to travel to Orion's sword, which is right below Orion's Belt. I might walk up the hill to the top of the neighborhood. We'll see. I like the idea of lying on my chaise with a straw hat and a mint julep. I'm bad...sold my extra glasses for $20. think I'll go hit some golf balls during ellipse. if ya miss it -- it'll be really dark again at midnite. trebor posted this on fb -- and it's too good not to post here. ETA: We (surveyors) used to use sun shots on a regular basis as a means of getting true north and there was always the joke you used on new guys; How many sun shots can you take without using a sun filter? Two. I used to have a sign in my lab saying "DANGER: Do not stare into laser with remaining eyeball." EH&S made me take it down. pick me up and drop me off at Katahdin. Well Scotty, hope ya got to see it wherever ya landed. No totality Up North here, but being on site with a couple of thousand science geeks has its own advantages. 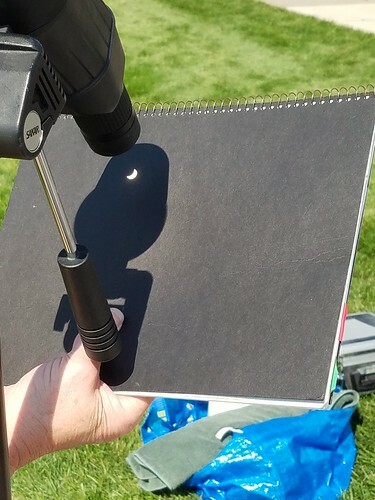 A colleague projects a solar image through a monocular. 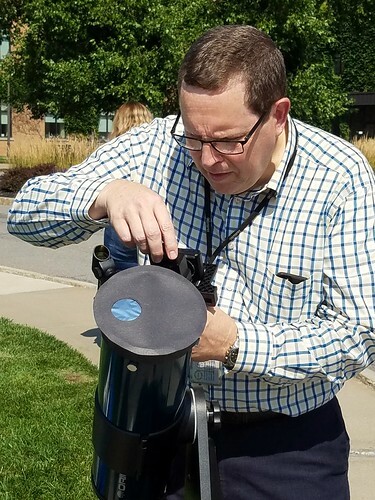 Another colleague sets up a Dobsonian telescope for direct viewing. 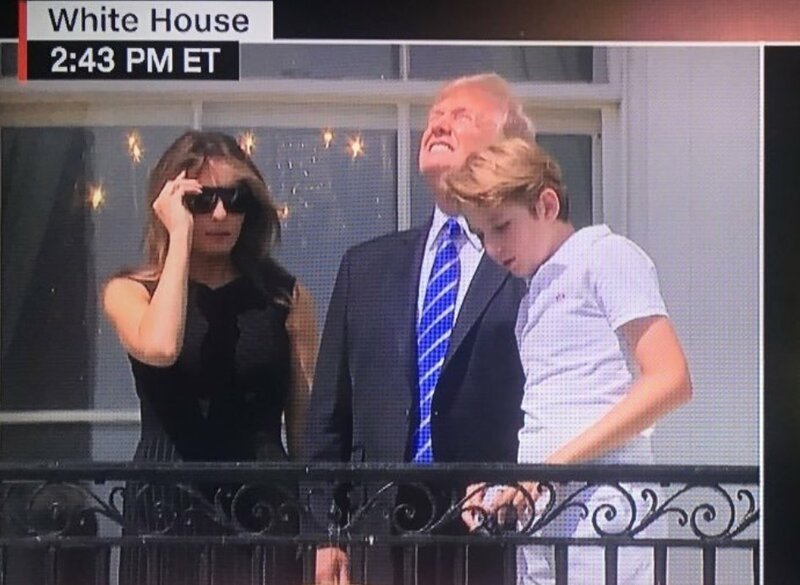 trump ain't afraid of the stupid sun!!! Now is the time to stockpile eclipse glasses for the Texas to Maine 2024 event. "It's gonna be great, it's gonna be better than great, it's gonna be fantastic, really fantastic!" A local radio station played Pink Floyd Dark Side of the Moon all day. Interesting observation here as the 80% partial progressed - all the Vultures came down low and hid in the trees till it was over. My guess is the Thermals stopped as the temperature dropped. Don't forget the 2019 transit of Mercury. I'm thinking to rent out our back yard (we are in the totality range and we have half an acre total) for tent pads. $1000 a night for a 10 by 10 area. Cash upfront and no refunds. Can use the hose for water. I might even unlock the shop where there is a toilet. $20 a minute too much for a shower? (I'll have to replace the 30 gallon heater first.....I'll get around to it....).